I am going through a period of experimentation with multigrain flours and grains, and love the wide variety of both now available to us in almost every store. One of my new favorite ingredients is oat flour and I just love the texture it gives to baked goods, not to mention the nutritional value it adds. Although I’ve always been a big fan of muffins, they can often be very high in fat and calories and not be very nutritional. I am working very hard lately to avoid foods that are nutritionally empty, so I try and add something extra to most of my baked goods to enhance the nutritional value. 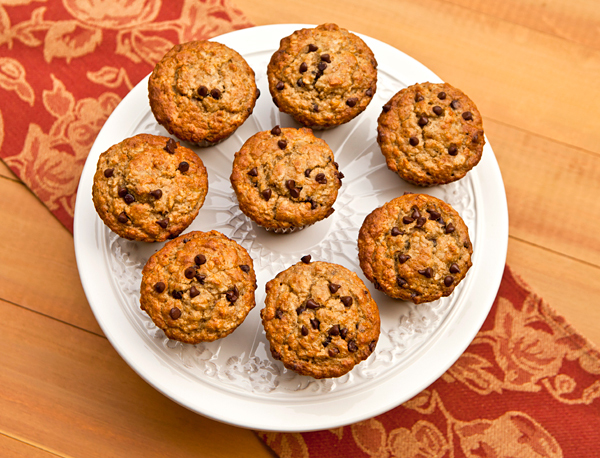 These muffins are made with both rolled oats and oat flour, and are very moist due to the addition of bananas and yogurt. I also added some chopped walnuts and mini dark chocolate chips which both add flavor. Bananas are one of our best sources of potassium, an essential mineral for maintaining normal blood pressure and heart function. Oats, via their high fiber content, are already known to help remove cholesterol from the digestive system that would otherwise end up in the bloodstream and have special antioxidant properties. Dark chocolate is a potent antioxidant and antioxidants gobble up free radicals, destructive molecules that are implicated in heart disease and other ailments. 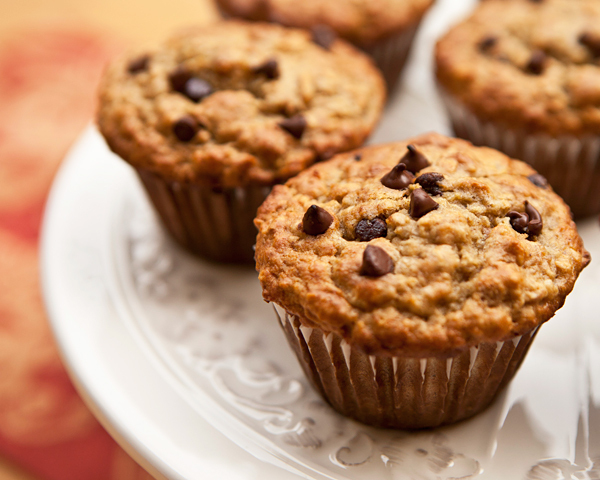 A moist muffin made with rolled oats and oat flour that is studded with walnuts and mini chocolate chips. Preheat oven to 375 degrees F. and line a muffin tin with 12 paper liners. In a bowl, mix together the rolled oats, yogurt, and milk and stir to mix. In another bowl, mix together the oat flour, brown sugar, baking powder, baking soda, salt, and cinnamon. Add the eggs, bananas, and oil to the rolled oats and yogurt mixture and stir to blend. Add the oat flour mixture to the wet ingredients and stir just until mixed. Stir in the walnuts and chocolate chips. Divide the batter between the muffin cups and then bake until firm to the touch and golden brown, about 16 to 18 minutes.